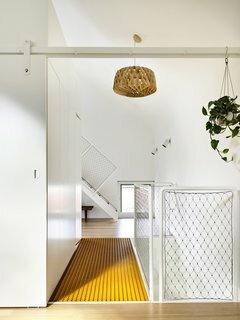 In Melbourne, a dark and narrow single-story terrace home gets treated to a delightful renovation with surprising features. 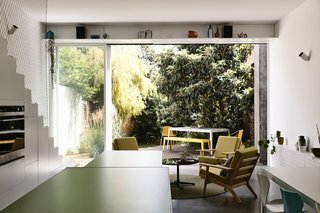 The playful aesthetics of Austin Maynard Architects have once again breathed new life into aging building stock—this time with the transformation of a dark and narrow terrace in Melbourne into an open and light-filled home fitted out with sustainable features. 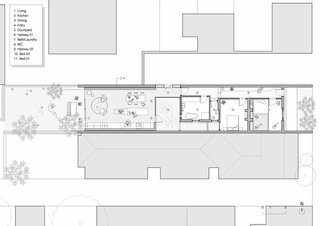 Located in North Fitzroy, the 2,272-square-foot Grant House is set on a long and narrow east-facing site with shared side alley access. 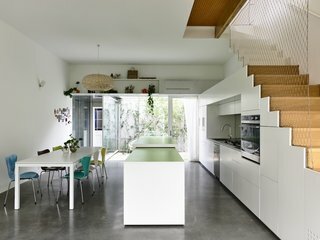 As with most inner-city terraced housing in Australia, the original home suffered from dark and narrow hallways as well as a lack of natural light and fresh air. What’s more, a 1980s renovation introduced an extension that complicated the floor plan. Yet these challenges were nothing new for the architectural practice, which has spent the past 15 years successfully regenerating similarly dark terraces. 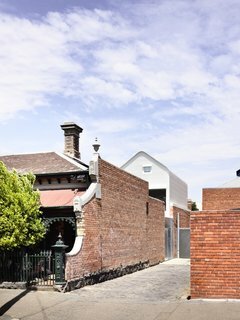 Instead of dwelling on the constraints, the architects focused their attention on the property’s chief asset: laneway access. Built of galvanized steel, the new front door conveys safety and security. 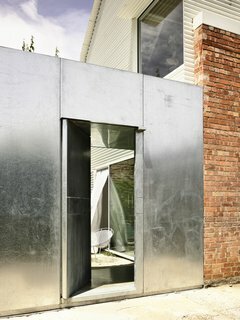 The owners had previously experienced a break-in, and they thought a more imposing entrance could serve as a deterrent. Directly behind the entry is the courtyard linking the old and new buildings. 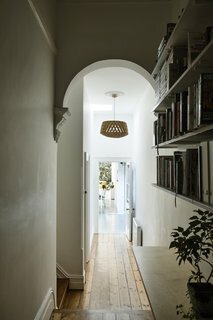 Access to a side laneway meant that the architects could move the entry from the front of the building to the side for direct access to the living room—a reconfiguration must-have for the clients, who hated the previous layout, which forced them to take guests down a long and dark corridor past bedrooms and a dim study to reach the entertaining areas. Planted with silver birch trees, a light-filled courtyard creates a visual and physical separation between the old building and new addition. 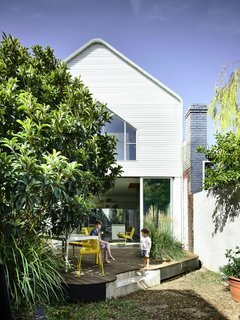 In addition to relocating the entrance, the architects stripped the 1980s extension and thoughtfully replaced it with a smaller addition that allows for an expanded rear garden. 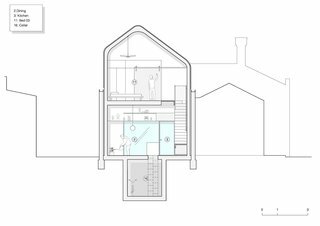 Greater natural light and ventilation is introduced through a new courtyard connecting the old house and the new two-story extension, which comprises open-plan living areas on the ground floor and the parents’ retreat upstairs. The original circulation blocked sight lines of the rear garden. The new configuration allows for direct garden views and greater access to daylight. 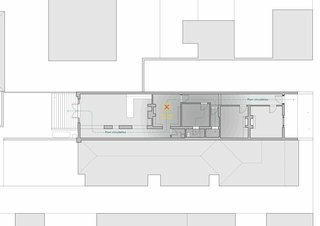 Full-height, insulated glazing slides open to expand the living room to the rear garden while maximizing access to natural light and ventilation. 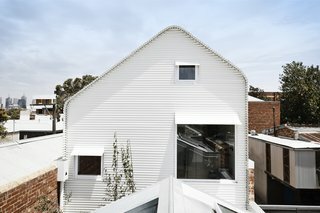 With the main challenges addressed, the architects took a more playful approach to the renovation—including the corrugated cardboard-inspired roof. "When you first begin to study architecture, in a naive way it seems easy, especially when you start model making," the architects explain. "You grab a piece of corrugated cardboard, wrap it over and think that looks awesome. That was easy. I’m an architect! Then, when you begin to consider constructing the same form on a realistic scale, the simplicity all falls apart. Grant House is a homage to those university days. The design has been executed as if it was that easy. Reminiscent of a corrugated cardboard model, the roof form of Grant—though highly detailed and complex—relates back to that one simple gesture, that one corrugated sheet bent over, to make a simple extruded form." 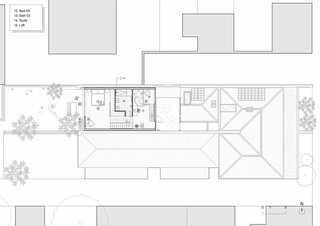 The architects designed an asymmetrical roof so as to avoid shading the neighbors' backyard. Note how the window awnings appear to peel up and away from the facade. 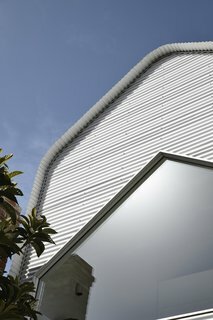 White Colorbond cladding wraps the new extension to maximize solar reflectance and reduce dependence on mechanical cooling. The shape of asymmetrical roof is repeated in the deck, which is designed "as if a slice [of the facade] has been cut and fallen down." The design decision harkens back to one of the firm’s core design principles: "If you have something to solve, try and borrow from what’s already been designed." "Designing a deck typically involves drawing a square or a rectangle," the architects say. "At Grant House we wanted something that pulled in the edges to allow for more garden at the sides. The answer was simple: what if the facade fell down?" A 3,000-liter rainwater harvesting tank is located beneath the rear deck, which is made from spotted gum with an oiled finish. 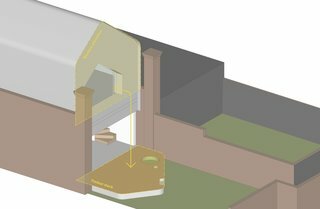 Creative solutions also abound indoors—most notably with the "hidden and secret" cellar. The clients asked for a basement, but floor space was in short supply—so the architects opted to hide the cellar entrance beneath a sliding kitchen island. In the original part of the home where the teenager’s bedroom is now located, the architects inserted a suspended platform bed with a hatch above leading to a "secret" plywood-lined roof space. 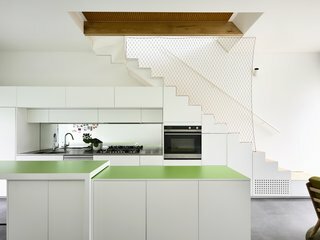 Juicy Green Laminex island countertops add a bright pop of color to the all-white kitchen. The rear countertops are stainless steel, and the backsplash is mirrored glass. 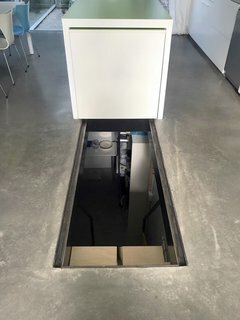 Part of the kitchen island slides back to reveal the hidden entrance to the cellar. For added protection, a perforated steel sheet can be used to cover the opening. The front of the terrace now houses a guest bedroom and (pictured here) the teenage son's bedroom. 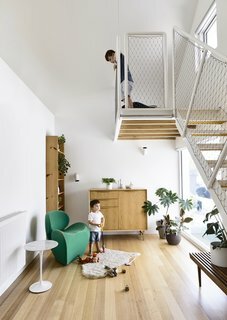 Taking advantage of the high ceiling, the architects added a suspended platform bed space, a lounging net, and a hatch that leads up to a "secret" roof space. Future-proofing was also a design priority. While the owners’ teenage son presently occupies the front part of the house, this area could later be used as a rental, as it comes with a separate entrance, bedroom, bathroom, and living area. The parents’ domain on the upper floor can also be divided into two bedrooms in the future. 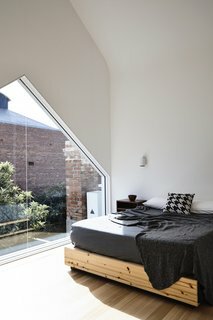 Bathed in west-facing light, the master bedroom includes a large window (also created in the shape of the roof) with views of the rear garden. 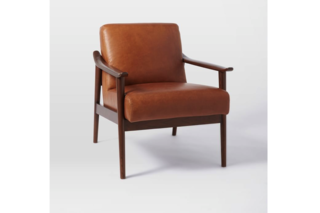 Named for the way its aniline leather seat peeks through its solid wood frame, our Midcentury Show Wood Chair packs good looks and comfort into one sleek silhouette. 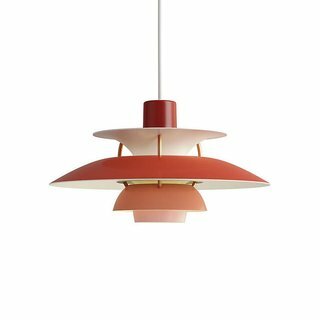 The PH 5 Mini Pendant by Louis Poulsen was designed by Poul Henningsen in 1958 to create glare-free light. With multiple finishes to choose from, hanging the pendant anywhere is easy. The pendant uses three shades. Back in 2013, my brother Kalen and I started our business out of necessity, and this product was at the center of it. We were both in a situation that left us without furniture and very little cash. 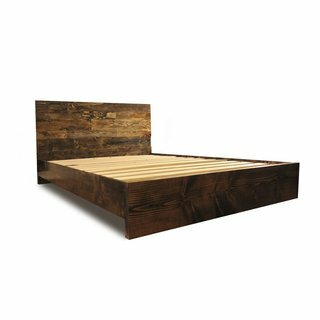 Without wanted to buy a new bed, we decided to build it instead. Upstairs, the "parents' retreat" includes a centrally located bathroom "box," seen on the left of the image. 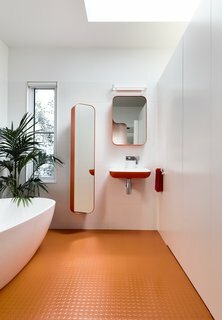 The bright orange walkway is perforated to let natural light pass through. A skylight illuminates the master bathroom, which is entirely outfitted with Arblu Tulip fixtures. The orange floor is Kenbrock K2 studded rubber. Note how the divisional wall stops short of the ceiling—a decision that the architects implemented to "create volume and height, which celebrate the curve of the ceiling." On the other side of the bathroom "box" is a lounge with a lofted reading room. 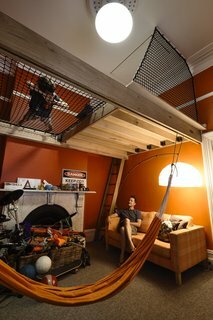 The space also serves as the perfect play room. Sustainable principles also drove the design—from the use of durable and low-maintenance materials and high-performance insulation to the addition of solar rooftop panels and rainwater harvesting systems. 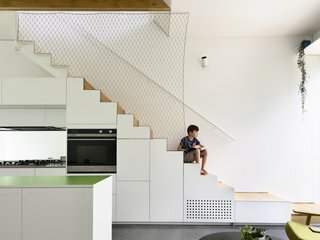 For a minimalist balustrade, the architects installed Ronstan Carl Stahl X-Tend stainless steel mesh to separate the stairs from the kitchen. 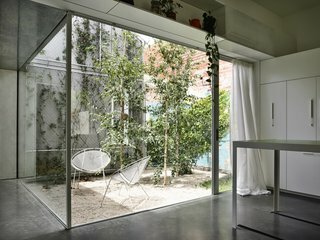 Polished concrete floors provides beneficial thermal mass in wintertime. 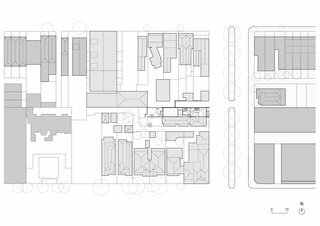 "Grant House has been designed to deal with a multitude of probabilities and possibilities, such as how to co-inhabit with a growing child, maximize re-sale and be generous to your neighbors with reciprocal renovation opportunity," the architects explain. "By future-proofing with design forethought, multifunctional spaces can evolve as needs change without having to demolish and rebuild." 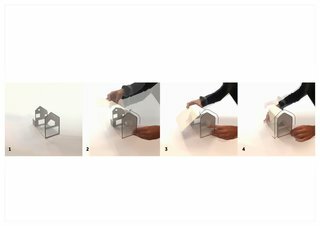 Austin Maynard Architects' concept images show a person wrapping the house model with a white corrugated sheet.